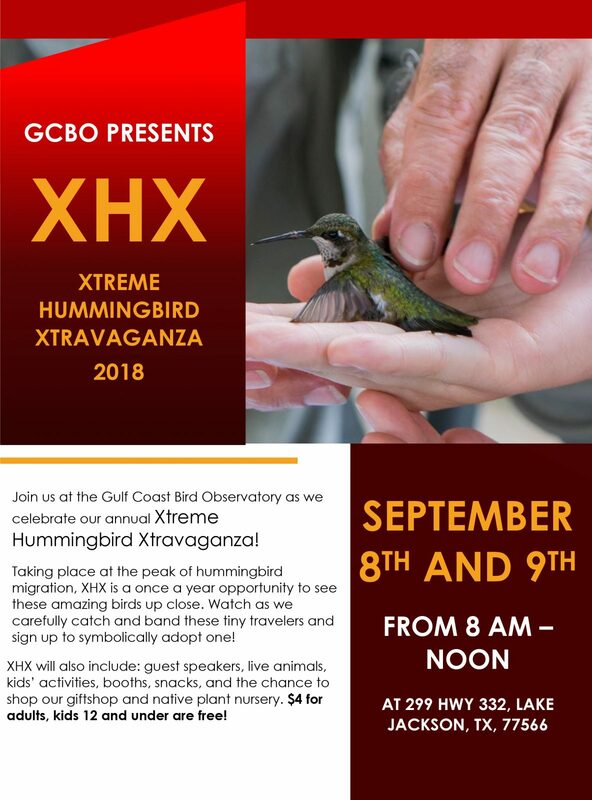 XHX is yearly event at GCBO that takes place during the peak of Ruby-throated Hummingbird migration in the fall. It features live hummingbird banding and symbolic hummingbird adoptions where you get the opportunity to see these amazing birds up close and in the hand! There will be informative and entertaining talks held both days, activities for the kids, live animals at nature booths, a hummingbird & butterfly plant sale, our nature gift shop is open, and snacks and drink will be available for purchase. Ruby-throated hummingbirds weigh, on average, about as much as a penny. Despite their small size some complete an annual jouney of 1,300 miles from breeding grounds as far north as Canada to wintering grounds in Central America. In the fall most begin migrating south between late August and mid September. When they reach the Gulf some fly straight across, marathoning an 18-24 hour journey across the ocean! They do not learn their migration routes from their parents but are very faithful to the route they choose. The same individual hummingbirds have been caught on the same day at the same spot in their migration for multiple years! One of the big attractions at XHX is our live hummingbird banding. Hummers are caught in special traps and handled by professional banders. They are then weighed, measured, sexed, and banded. The bands that go around a hummer’s leg are tiny! Banding data allows us to collect information on individual hummingbirds that help us study their health and migration patterns. Symbolically ‘adopt’ a hummingbird at XHX for a special chance to release your banded hummer! You will also receive updates if your bird is caught in the future!